Renowned for its dynamic interpretations and polished, expansive colors, the group has rapidly distinguished itself as one of the preeminent ensembles of its generation. 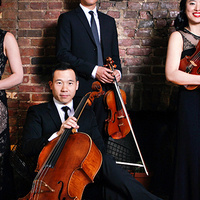 The quartet has won numerous honors, such as the Concert Artists Guild Competition, the Grand Prix and Mozart Prize at France’s Bordeaux International String Quartet Competition, and Chamber Music America’s prestigious Cleveland Quartet Award. Parker Quartet’s members are currently artists-in-residence at Harvard University. The Grammy Award-winning Parker Quartet, called “something extraordinary” by The New York Times, will be performing string quartets by Felix Mendelssohn and Beethoven at the Jack H. Miller Center for Musical Arts on Friday, Feb. 16.